Twerton Park has not seen an afternoon quite like this for a long old while. 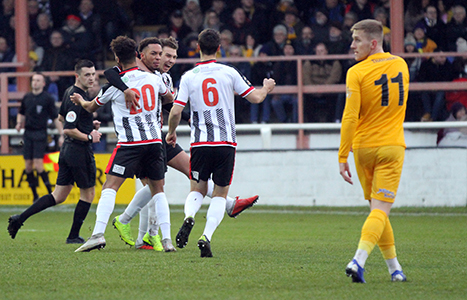 A record National League South crowd of 3,492 at the ground witnessed Bath City complete an astonishing comeback as two goals in the final eight minutes downed league leaders Torquay United. The game ebbed from an early City lead, earned through Freddie Hinds’ first Romans goal, to the Gulls appearing set for victory having turned matters around themselves, Asa Hall and Jamie Reid converting corners either side of the break. Torquay could even have killed off the match when Jake Andrews blazed a penalty into low orbit, yet it was from the spot that City levelled through skipper Anthony Straker. And Straker then turned provider, burning past two defenders down the left flank and sweeping in a low cross for substitute Ryan Brunt to expertly divert into the far corner. The final act in stoppage time saw former City academy youngster Saikou Janneh scoop over the top from a couple of yards out to close out a genuinely remarkable contest befitting of a first-versus-third face-off. The crowd was the highest for a City league fixture at the ground for over 40 years with a lively atmosphere as over 2,000 home fans were joined by nearly 1,500 travelling from Devon. 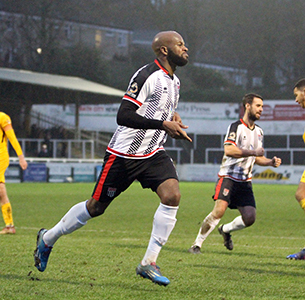 The result extended the Romans’ unbeaten run to eight games, including six wins, while sinking Torquay’s own stretch of 16 matches unbeaten in the league since Gary Johnson – left to watch the game from the stands as part of a touchline ban – took charge. Torquay might easily have gone ahead with the first attack of the game, if not for Kalvin Kalala wastefully volleying over Janneh’s cross, after the frontman had gotten by Kevin Amankwaah at the byline. Joe Raynes gave Gulls keeper Shaun MacDonald his first piece of work on the afternoon with a tame shot from distance, before the opening goal arrived on nine minutes. It was Raynes that got the assist, picking up a loose ball at the edge of the final third as Torquay were caught ball watching. With acres of space to run into, Raynes sensibly turned down the opportunity to shoot from range and instead slid the ball through for Hinds to lash in off the bar. Sean Rigg also curled wide from distance as the Romans knocked the ball around well in the opening 35 minutes. But more importantly they ensured the Gulls had no time or space to play the game they wished, leaving Torquay visibly frustrated. Most of the visitors’ progress came out wide and until the closing ten minutes of the half, their chances came from outside the box, two City bodies nevertheless important to block Reid out at the edge of the box. A slither of Amankwaah’s toe got an all-important touch when Janneh whistled a low ball across the face of the six-yard box, Reid denied the scoring touch. The City defence stuck tight to Janneh throughout and deflected his next effort behind. But it was from that corner that Torquay pulled level, Hall nodding home Andrews’ right-wing corner as home keeper Ryan Clarke came out but failed to get a touch from among the packed maul of bodies in front of him. Off the pitch that goal sparked a pitch invasion from a small minority of the away fans making the trip, joined on the turf by a yellow smoke bomb. The second period opened up with Hinds driving a cross-shot into the midriff of MacDonald. However, it was Torquay that began to put their stamp on the contest as City struggled for concerted spells of possession, misplacing both passes and clearances. 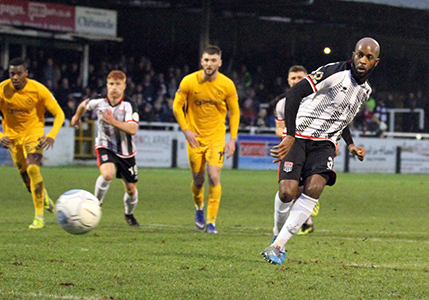 Janneh had another shooting opportunity when the ball dropped kindly as he and Jack Batten met in an aerial duel, only to blast his effort out of the ground. Set-piece specialist Andrews forced Clarke to tip a free-kick – given up when Straker upended Janneh and got a yellow for his troubles – over the crossbar. The resulting corner flew across the face of goal but out for a goal kick. Forward the Gulls continued to come, substitute Ruari Keating missing the target from inside the D, and Janneh scuffing either a cross or a shot behind having spun off an ambitious Batten challenge on the right. He got another chance shortly. After Artus was dispossesed near halfway, Janneh was handed the ball at the edge of the box, and twisted and turned before ultimately seeing a shot nicked behind by a defender. And after a couple of flag kicks the second Torquay goal arrived as Reid nudged in from almost on the line. The Gulls could easily have put the game to bed when Stripes debutant Leon Davies tripped Andrews in the box, only to step up to the spot himself and thump the spot kick miles over the bar. Just to rub it in on Andrews, it was a penalty that drew the Romans level. Brunt was clumsily tripped from behind by skipper Hall, Straker heading to the mark and coolly sending MacDonald the wrong way for his sixth goal of the campaign. They were not done there as Straker turned provider, tearing down the left and whipping in a low ball Brunt beautifully clipped into the far corner. Far from over, Torquay were given an additional five minutes to find a leveller. As City were forced to defend deep, Keating nodded a long cross straight into the hands of Clarke. Liam Davis also speared an effort low towards the near post the home custodian turned behind, and from the resulting corner came the final drama of an absorbing contest. Keeper MacDonald went up and was left unmarked past the far post. The ball found it’s way through to him, with enough time to take a touch and hammer towards goal where Janneh turned over from two yards out. City’s Line-Up: Clarke, Amankwaah (Smith HT), Straker (c), Batten, Artus, Rigg, Hinds (Brunt 76), Stearn (Watkins 67), Cundy, Raynes, Davies. Subs not used: H Wiles-Richards, Ball.